The drugmaker's stock took a dip in October over the raging drug pricing debate. Shares of Botox maker Allergan (NYSE:AGN) shed nearly 14% of their value in October, according to data from S&P Global Market Intelligence. The silver lining is that Allergan's shares appear to have slumped simply as a result of the growing fear of a Hillary Clinton presidency that may spark a legal and political battle over drug pricing in the United States. Allergan, after all, maintained radio silence for most of the month, and many of its peers performed equally poorly as well, on little to no news. This arguably irrational fear that's been slamming biopharmas like Allergan lately is perhaps overblown at this point. Allergan's shares are currently trading close to their 52-week lows -- even though the drugmaker has markedly improved its balance sheet, continues to post strong growth within its branded pharma segment, and has an outstanding shareholder rewards program in place. 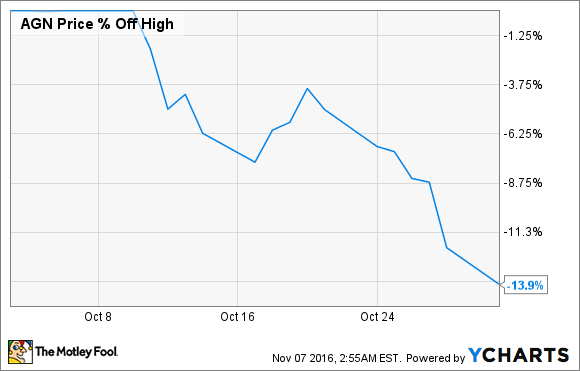 Allergan's fate does not depend solely on the outcome of the election come Tuesday, even though the market seems to think otherwise. The fact of the matter is that Allergan sports a diverse portfolio of growth products, many of which are just now hitting their stride commercially. Take for instance Allergan's all-important eye care franchise that sports products like Restasis, Lumigan, and Ozurdex. In the third quarter, the company reported that total eye care product sales rose by an astounding 46.5% in the first nine months of 2016 compared to the same period in 2015. That's outstanding growth for a large cap pharma in any environment -- yet the market has turned a blind eye purely as a result of the ongoing political turmoil. Of course, there is the offhand chance that Clinton, if she were to win, would attempt to follow through on her campaign rhetoric regarding drug prices. Even so, this remote possibility appears to be more than baked into Allergan's price at this point, implying that now may indeed be a good time to start buying this top pharma stock.